It's nonsense but here we are with an idiot POTUS that believes this kind of crap, and in addition they are looking for an excuse to demonize Cuba anyway because ... Obama, brown people. Come on, you really can’t expect decent US American diplomats to enjoy staying in a third-world hellhole like Cuba! According to a 2014 report by The World Bank, Cuba has the best education system in Latin American and the Caribbean and (is) the only country on the continent to have a high-level teaching faculty. The World Bank Report also praises Cuba for its success in the fields of education and health, with social services that exceeds those of most developing countries and, in certain sectors, are comparable to those of the developed nations. The country’s social system that ensures state-sponsored universal access to education and health services has helped Cuba to achieve universal literacy, eradicate certain diseases and provide universal access to safe drinking water and basic public sanitation. Cuba now has one of the region’s lowest infant mortality rates and longest life expectancies. The FBI and other agencies that searched homes and hotels where incidents occurred found no devices. And clues about the circumstances of the incidents seem to make any explanation scientifically implausible. Al Jazeera's Patty Culhane, reporting from Washington, DC, described the case as a "bizarre international mystery". "The US is taking these steps and you might ask, "Do they have some evidence? Was Cuba involved?' Well, the answer is 'no'," she said. "Senior US State Department officials say the investigation is ongoing and that they still have absolutely no idea what harmed their diplomats. Although U.S. search teams in Iraq have so far produced no proof of weapons of mass destruction, President Bush said Monday he remains "absolutely convinced" the evidence will be found. Why doesn't somebody call Hans Blix?! Last edited by dann; 30th September 2017 at 01:52 PM. I'm glad Snopes addressed it. And I'm confident they got it right as I noted above. This kind of false belief is common and has many common features involved like people's symptoms are inconsistent and there is a focus of the CT like an employer or in this case the Cuban government. You mean to tell me sonic attacks are NOT the cause of Morgellons ? That the symptoms suffered by US diplmats still might be caused by aliens? In 2008, the Washington Post reported that Internet discussions about Morgellons include many conspiracy theories about the cause, including biological warfare, nanotechnology, chemtrails and extraterrestrial life. or that the POTUS, Commander in Chief Donald Trump, suffers from Munchausen by proxy? Psychology Today reports that Leitao last consulted an unnamed Johns Hopkins infectious disease specialist who, after reviewing her son's records refused to see him, suggesting Leitao herself might have "Munchausen's by proxy, a psychiatric syndrome in which a parent pretends a child is sick or makes him sick to get attention from the medical system". I look forward to the article in Psycology Today. By the way, in the trailer for the Cuban film Juan de los Muertos (Wikipedia) // Juan of the Dead (Wikipedia), you can see the building of the US embassy in Havana (when the movie was made: the US Interest Section) in the background, behind the attacking 'dissidents', from 0:36 to 0:38. At the news conference Tuesday, Rodríguez Parilla said Cuban investigators had no evidence that any attacks had taken place and that the US needed to allow the Cubans access to affected diplomats and the doctors in the US that have treated them. He also said Cuban investigators have not been allowed by the US to examine the residences in Havana where the American diplomats reported the alleged attacks. It sounds like a 60's fantasy, undisclosed "weapons" targeting US diplomats and IMO it's even more ridiculous when Cuban diplomats are being expelled for not doing enough to stop an "attack" where it's not clear that an attack happened and no-one can say who is suspected of the attack and how they might have carried it out. You aren't wearing a tinfoil hat to come to the more reasonable conclusion. The hatters LOVE this story! A couple days ago the AP news was that the first 'diplomats' affected, just days after Trumps election, were intelligence officers... aka SPIES! It seems several sources were willing to confirm this to reporters. Adding legs to the 'attack' story? But I don't believe it was manufactured from the start. They took it, fed it, and grew it to ridiculous proportions. If you have ever watched young children play and one of them falls or scrapes a knee, there is a moment where they look up to gauge the adult reaction. Stay calm and the kid isn't likely to cry. They stop for a few seconds and go on playing. Rush in and make a big deal and not only will the fallen kid cry, but the other kids get worried and upset as well! A couple days ago the AP news was that the first 'diplomats' affected, just days after Trumps election, were intelligence officers... aka SPIES! "Since we issued the September 29 Travel Warning, we have received a handful of reports from U.S. citizens who report they experienced similar symptoms following stays in Cuba," a State Department official told CBS News. "We have no way of verifying whether they were harmed by the same attacks targeting official U.S. employees." Aggression against U.S. diplomats in Havana: Unfounded and implausible (Oct. 5), from the Cuban newspaper Granma, which Breitbart calls ”communist propaganda outlet Granma”. “I believe those people got something that hurt them,” said Dr. Qin. “But it could be something in the environment.” The possibilities include toxins, or bacterial or viral infections, that can damage hearing. Dr. Leighton said contagious anxiety or another psychogenic contributor couldn’t be ruled out. “If you make people anxious that they’re under attack from an ultrasonic weapon, those are the symptoms you’ll get,” he said. Exactly. How does a doctor verify 'hearing loss' independent of the patients reporting? Normal hearing tests use tones where the patient raises their hand when they can hear it. To really determine it, they'd have to look at how the brain itself responds to sound, independent of what the person says they can/cannot hear. The rest of the article hypothesizes that a combination of chemicals (ototoxicity) and sonics might have caused the symptoms suffered by the U.S. spies in Cuba. Quite interesting divergent developments about this affair since yesterday. On the one hand, the Guardian published an article relying upon "[s]enior neurologists " to push a "mass hysteria" explanatory hypothesis (BTW, "mass hysteria" has been relabeled mass psychogenic illness since the nineties). Obviously, major news medias then analyzed this audio file, like in making a specter analysis. And cautiously commented about it, a worthy example being an NBC article: "Listen to What Americans Heard in Mysterious Cuba Sound ‘Incidents’". 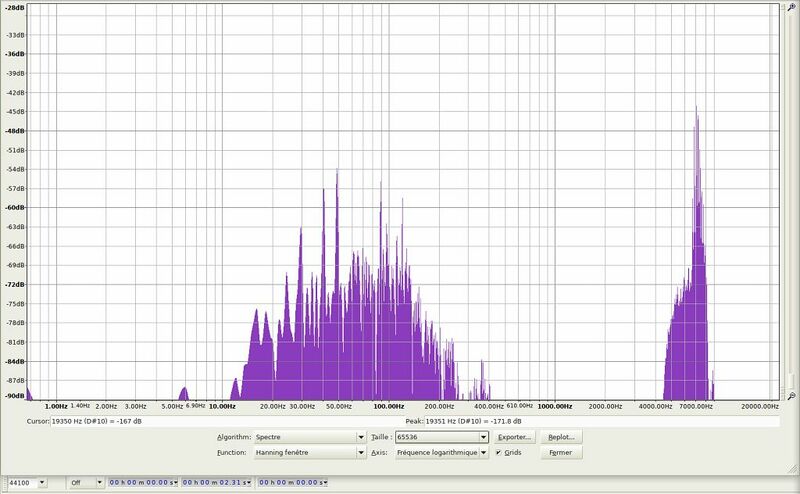 Out of the obvious 50-240 Hz AC hum/noise background parasitizing the recording device (I've a lot of it on my own records ), what's curious is around the 7000 Hz peak. I'll focus on it if you're interested. Yes, please focus! And let us know if it encourages us to commit ritual satanic abuse if you play it backwards! Just as I suspected - bad fluorescent light ballasts! What was this audio recorded with? How much of the spectrum was lost? This is so stupid. Any of us who have been at this site long enough have seen this phenomenon before in the paranormal section. It's called bullcrap. 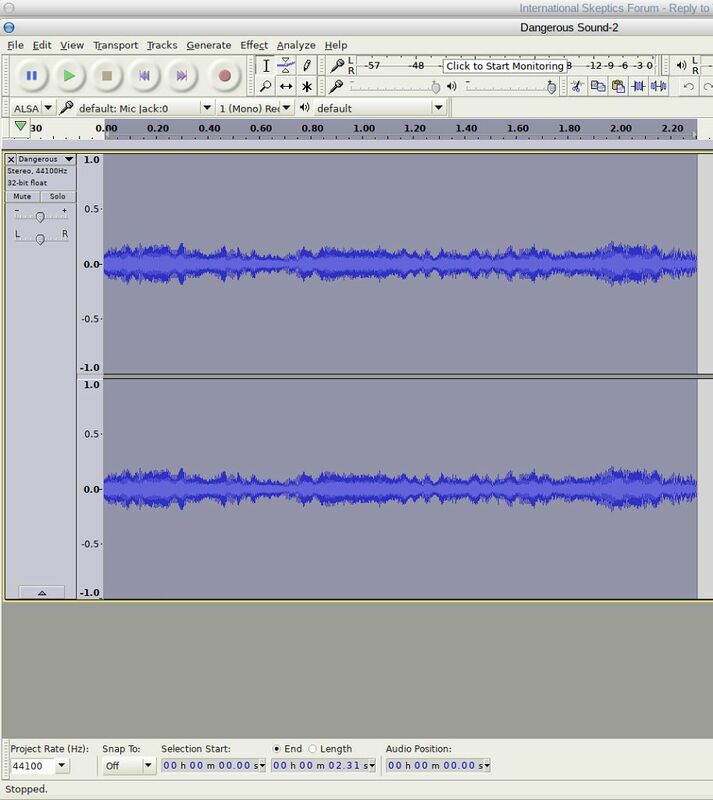 What was this audio recorded with? How much of the spectrum was lost? Yet the AP has reviewed several recordings from Havana taken under different circumstances, and all have variations of the same high-pitched sound. Individuals who have heard the noise in Havana confirm (!!!) the recordings are generally consistent with what they heard. and ask them: "Is this what your abductors looked like?!" Forgive me, but I have an immensely difficult time believing this is inadvertent leaking sound from radio equipment, or some badly-installed air conditioning unit. Me too! But I have an even harder time believing that this is the emission of a super-sonic weapon (or even listening device) targeted at U.S. diplomats in order to make them deaf (or inadvertently rendering them so). 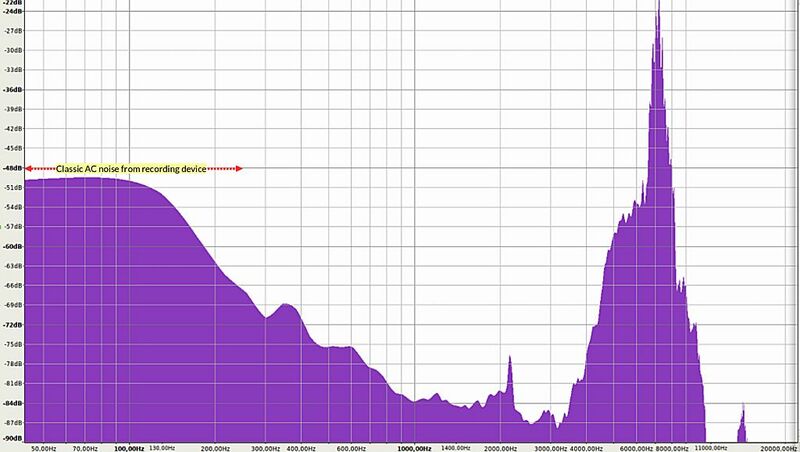 A tone at 8k is very directional, very hearable, and won't penetrate most solid walls. There may have been other elements to the sound, but if that 8k was there, all you had to do was locate the sound by ear and say wtf, maybe put in some foam earplugs, go to a different room or leave the building. I do that kind of thing all the time in response to noise. Could you sleep through some "sonic attack" that was damaging your hearing? It seems too weird to be true, but maybe. Restoring more normal relations with Cuba is a good thing. A friend of mine who lives in the Bay area went on a vacation to Cuba a few months ago with a tour group. Said it was a good deal, and he'd recommend it to anyone. I understood that the Cuban government welcomed the re-establishment of connections with the US. Why would they want to cause this disruption? Given some of the third world places my sister lived when she worked for the State Department ... yes, I do. Helicopters don't so much fly as beat the air into submission. Quite obviously it could not have been supersonic if embassy personnel were able to hear and record the sound using traditional devices. There may have been other elements to the sound, but if that 8k was there, all you had to do was locate the sound by ear and say wtf, maybe put in some foam earplugs, go to a different room or leave the building. There are; the original AP report said that this published bit was an excerpt - that according to the State Department investigators there were several recordings, that featured multi-tonal sounds with characteristics that differed from recording to recording, but that all of them had this particular element in common. Last edited by Checkmite; 15th October 2017 at 05:32 PM. Some embassy personnel - if this is a real, actual recording of the alleged attacks. Others didn't hear (or record) a thing. Lots of well defined peaks and harmonics in what appeared as an undifferentiated mound at low "sizes". Both 40Hz and 50Hz AC peaks and their harmonics (until ~240Hz) are present. And also 15, 17, 25, and 30Hz peaks (all those ± 2Hz). The mound morphed into a fancy fractal. It seems weird there could be an invisible dragon in my garage, but maybe. It's not like we don't understand the physics of sound, infra or not. Some reporters are so gullible. These recordings are akin to videos of ghosts and moving lights in the sky. Last edited by Agatha; 21st October 2017 at 06:02 AM. I have a covert recording of what happened to those US diplomats. We can see typical Cuban technology apparently dating from the 1960's. A paper reviewing the issue here. Last edited by Planigale; 19th October 2017 at 12:01 AM. Wherever all the "infrasound" and "ghost" absurdity came from I don't know; I wasn't aware that anyone anywhere was proposing that. But as for this noise - which is obviously a quite real thing - it really sounds to me like it does have a similar character to other noises produced by devices that are designed intentionally to irritate; i.e for crowd control, or by commercial ships to repel attackers and protesters, that kind of thing. Let's assume for the moment that it's not. What might it be then instead? With respect to dann, it doesn't sound like any modem I've ever personally heard or have been able to find a sample of online. I suppose it's possible it might be some other kind of digital data mode. I'm familiar with some of these and have been trying to match it, but it just doesn't sound quite like any I personally know about - closest it comes is maybe PSK31 - but it doesn't seem to contain any of the "inflection" that common digital modes have. Plus you run into the problem that you actually need an HF receiver to pick them up and turn them into audible sound; it's not like someone would be "accidentally" physically hearing a PSK31 or RTTY signal because of a chance building arrangement or a badly made speaker component picking it up and resonating. No, we don't know that. There is no consistent 'noise' that has been detected. There's a mish-mash from nothing to some static or whining that for all we know came from the recording devices. We agree. I simply lean toward the Trump admin. exaggerating this, as opposed to the mass hysteria explanation. According to the AP, the specific sound that's been published occurred in several different recordings. I have no idea what that signifies! Most of it seems to be way beyond the range of human hearing, so what would be the point of it? To annoy dolphins or scare away bats? !